This blog post is long overdue. I have had countless people – friends, family members, athletes, clients – all ask me about shin splints. OK, before the Athletic Trainers, Physicians, PTs and other health care providers jump down my throat. Yes, shin splints is a junk term. I am talking about MTSS. I understand this, but the people you treat know them as MTSS, so relax. What are they? How can I get rid of them? Can they be prevented? Despite being one of the most common athletic injuries, recreational or competitive, shin splints are easily treatable and very preventable. Too often sufferer’s deal with the pain and never fix the problem. My goal with this blog is to provide tips to fix the problem and resolve shin splint pain. Shin splints, or Medial Tibial Stress Syndrome (MTSS), is a chronic injury typically described as dull-ache on the medial, mid-to-lower-third portion of the lower leg. Pain is common during or after activity. In severe cases pain may last for several hours after activity and occasionally the individual will experience nighttime throbbing in the lower leg. The pain from MTSS is attributed to irritation of the periosteum – a saran wrap like covering around bone – or a stress reaction to the underlying bone. Repetitive pounding or muscle pulling from these structures precipitates the injury. Popular belief is that shin splints are due to poor shoes, training intensity, and training surfaces. However, a critical review article written by Moen, Tol, et al., published in 2009 Sports Medicine found this was not the case. MTSS is often caused by poor joint movement and muscle imbalance. These movement patterns and muscle imbalances are easily identifiable. The best part is that you can fix these problems at home by following a simple flexibility and strengthening program. Blue lines illustrate normal hip-knee-ankle-foot alignment. Red Lines illustrate femoral and tibial adduction and foot external rotation. 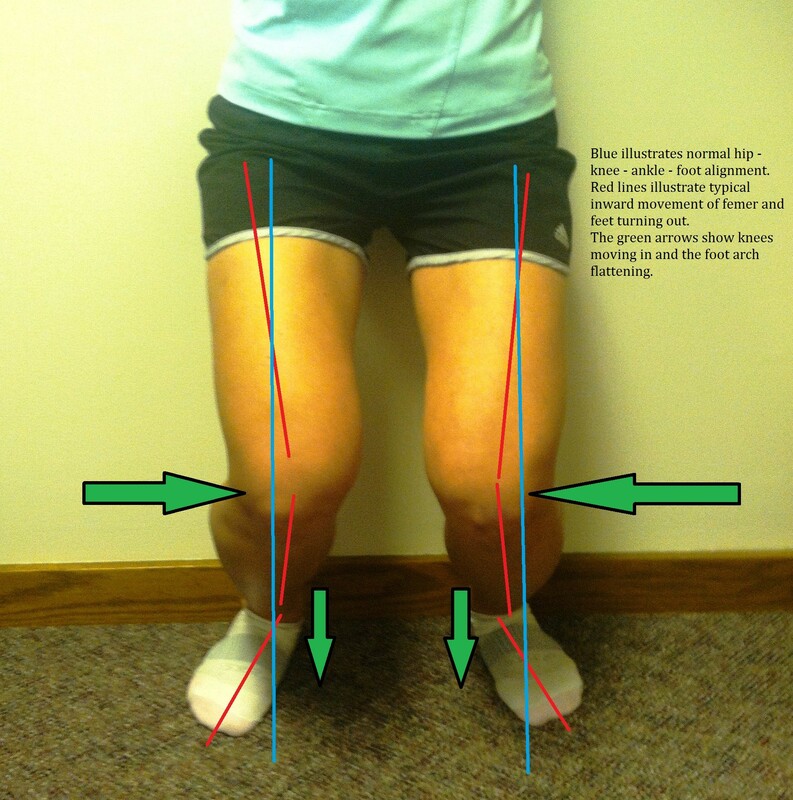 Green arrows show knees caving in and foot arch flattening. First, let’s see if you have these movement dysfunctions. Observe yourself (in a mirror) walking or doing repeated squats. Do you see one or more of these four things: hips in, knees in, feet flatten, or toes point out? You may have one or all of these patterns; some may be extremely pronounced or could be very subtle. The image here shows a moderate to severe movement. If you observe this, even to the slightest degree, you are at risk for developing shin splints. Overtime, these movement patterns create a muscle imbalance, where some muscles become overactive and some become underactive. Using the above figure as an example, here are the typical overactive and underactive muscles we would see in a person with shin splints or with these movement patterns. Our goal is simple, turn-off the overactive and turn-on the underactive; simple as that. Below is a basic 3-step program that can help correct this issue, step 1 -Turn-off, step 2 – elongate, and step 3 – turn-on. This program can be done daily and would take no longer than 30 minutes from start to finish. Here is what a basic program would look like. Foam rolling is the best way to do this if you go at it alone. If you have a qualified therapist, manual release of these muscles will do the trick. When foam rolling, roll each muscle for 90 seconds and hold tender areas for 20-30 seconds. A YouTube playlist I created, provides good examples and tips on how to perform these techniques. Perform 1-2 sets of the stretch per muscle group and hold the stretch for a maximum of 30 seconds. Brent Brookbush, has a good static stretching playlist that demonstrates these exercises. The above exercises are just examples. There are many exercises to choose from. The important thing is to target the right muscles. Fix the core, attack the glute medius and glute maximus, and work the tibialis anterior and posterior. In summary, too often I see individuals with shin pain ceasing activity, buying new shoes, investing hundreds of dollars in custom orthotics, or giving themselves an ice bath. Shin splints do not have to be the end of training. They are easily preventable and curable as long as you fix the problem. Following a simple and structured program to correct of common movement dysfunction patterns can eliminate shin splints and many other lower body injuries like Achilles pain, runner’s knee or hip pain. This entry was posted in Fitness Training, Injury prevention, Rehabilitation, Sports Medicine and tagged Janda, lower cross syndrome, Medial Tibial Stress Syndrome, MTSS, plantar fasciitis, runners pain, shin pain, shin splints on July 16, 2013 by Joshua Stone. Just like you said I as well was told the myth that it was about the shoes I was wearing or the training surface. I was told these things by my high school track coach. She and he would tell us this all the time. It makes me glad that there are people that can debunk the myths so that we can share and explain the whys and hows of things to others so that later down the road maybe there won’t be as much of these “myths” going around. I think I need to share this with some friends I know. Thanks in advance for sharing. Your coaches are nto entirely wrong. Old shoes with high mileage can lose stability, but if you have the neuromusclar control it will not matter. This is a reason why barefoot running has become so popular and has been shown to reduce incidence of shin splints. Barefoot running improves these inhibited muscles and can improve function, resulting in decreased pain. Excellent article! Shin splints drove me nuts and I tackled the problem with a variety of changes, from building muscle with weight exercises, even changing the matress to a way harder one plus yoga for stretching. Believe it or not, the mattress change made a huge difference (I think about this now lIke braces for teeth. Soft matresses brough my body out of its naural alignment and the change to the tough 4 inch futon provides the brace). From your article I can see why this worked. I have no more shin splints but need to keep xercising daily, keeping all the muscles and bones in their proper place. And yes, foam rolling works well to complement all that but can’t replace growing new muscle. The videos in step 3 for turning on the underactive muscles do not work anymore. is there a way to fix this? ?